Edmonton is warming up and puddles lakes are forming all over the city, but the balmy weather hasn't stopped me from craving hot noodle soup. I recently heard about a restaurant in Chinatown offering bowls of noodle soup where you are in control of the soup base, noodles and ingredients that end up in your bowl. Tao Garden is located right behind the Chinatown Lucky 97 Supermarket, somewhat hidden away from the busy traffic on 97 Street. I remember eating at the restaurant that previously occupied this space many years ago, but I have no recollection whatsoever of the food or overall experience. 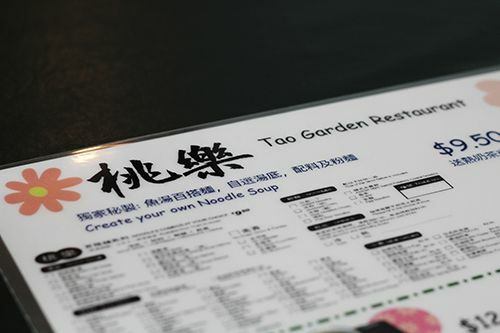 Regardless, the interior of Tao Garden is bright, clean, and televisions feature Chinese TV shows to watch as you sit and enjoy your meal. 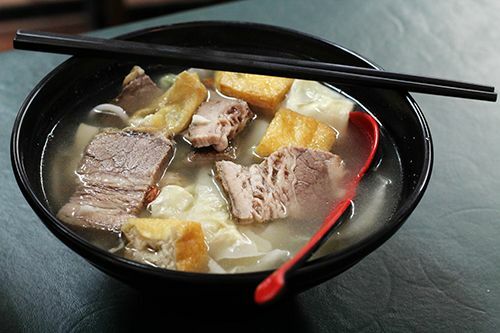 The menu features hot pots, rice pots, and other smaller snack items like congee, dumplings, and curry fish balls, but what I was most interested in was the option to build your own bowl of noodle soup. When I'm in Hong Kong I love going to the hole-in-the-wall noodle shops that allow you to customize bowls to your own liking, so I'm glad that Tao Garden offers this type of dining. For $9.50 you get to create your own bowl, which you customize to your liking on an individualized order sheet. The price includes your choice of one soup base, two toppings, your choice of noodles, and either hot coffee or milk tea. Each bowl also comes with green onion, cilantro, suey choy, sliced mushrooms, and bean curd skin, but if you're not a fan of any of those there's the option to exclude them from your bowl too. The menu is extensive and the combinations are endless! You can choose from 12 different soup bases, 35 different toppings, 8 types of noodles, and you can opt for additional toppings at $1.25 each. If you're looking for a cold drink, it's an additional $1. Diane, Teresa and I stopped by for a late lunch last Saturday and we all enjoyed our bowls and agreed we would return in the future. The Little Sheep broth was full of flavour, and the satay soup came with an unexpected, but delicious, kick of heat. Toppings were fresh and the portion was very generous. At $9.50 a bowl with a drink included, you leave with a full tummy at an unbeatable price. The restaurant isn't anything fancy, but that's not why you should come to Tao Garden. 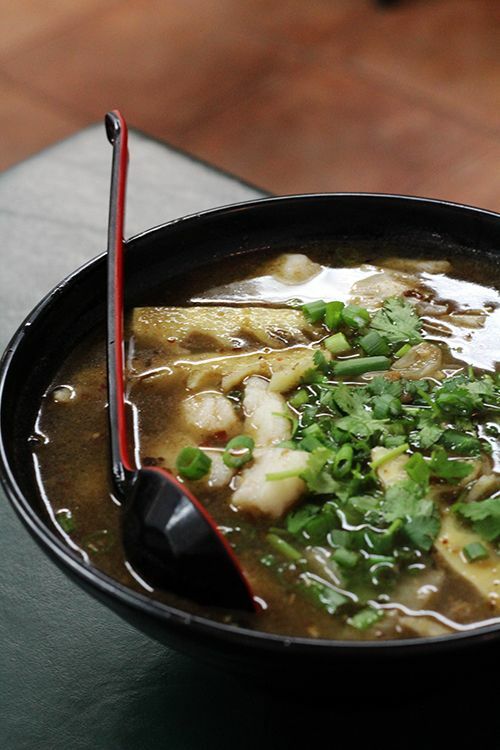 Come for the fun build-your-own noodle adventure and to warm up with a bowl of noodle soup. Edmonton is a cold, snowy city for the majority of the year. During the winter months I'm always looking for ways to warm up from the cold, and nothing is more comforting to me than a bowl of steaming noodle soup. 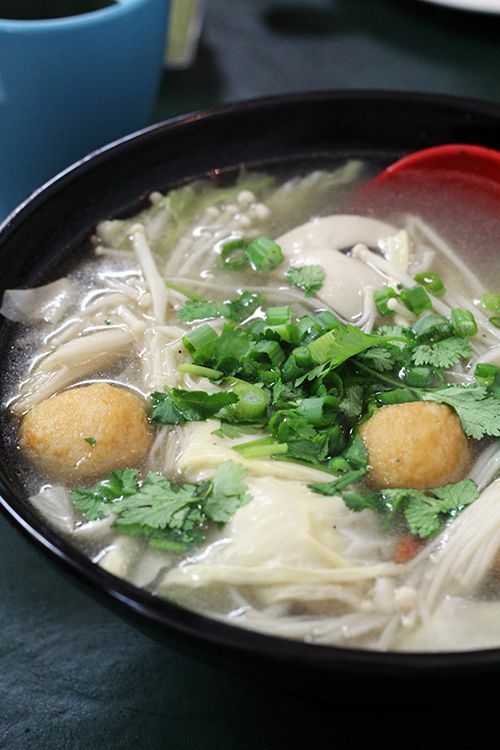 I'm going to be highlighting some of my favourite noodle soups in the city, and I'd love for you to share yours with me so I can try them too. Follow along with #YEGNoodleSoups and let the fun begin! This place looks really great! I'd totally love to try doing that but there aren't as many customize your noodle type shops here in singapore! We do have a ramen shop that does it but there aren't as many combos! I love my noodles and could eat a bowl everyday! I love this idea! With the weather supposedly taking a turning to the colder this weekend I'll have to check this place out soon! Andrea, your food pics are always making me hungry!